Michael Garnett produced a Man of the Match performance 32 shots as the Nottingham Panthers shut-out the Genting Casino Coventry Blaze 3-0 at the Motorpoint Arena. A goal came for Nottingham in each of the three periods, Robert Farmer (19.05), Brett Perlini (46.33) and Mark Hurtubise (54.37) all scoring, two of the efforts in the first and third coming on the powerplay. 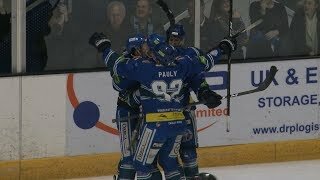 That was somewhat the story of the game with Panthers going 2/6 whilst the Blaze were unable to take advantage of any of their 6 opportunities with the man advantage. Chances came and went 5-on-5 too, but also at the other end Miroslav Kopriva had to be sharp all night long, like his counter-part also picking up the Man of the Match award for a third game running. The game became a physical one too with Coventry defenceman Trey Lewis fighting both Jacob Doty straight from a face-off and Jaynen Rissling after the Panthers player had run over Ross Venus with a huge open ice hit. After Venus was helped from the ice, and Lewis thrown from the game, the hits kept coming from the home side. Tyler Biggs notably taking a ten minute boarding misconduct penalty on Kevin Noble shortly after the 50 minute mark. 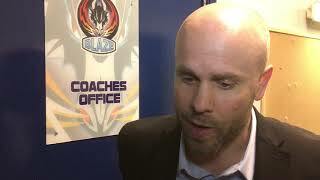 The game ended with Blaze's Nicolai Bryhnisveen and Panthers' Alex Guptill each receiving a ten minute misconduct penalty following a heated exchange of words between the two. Head Coach Danny Stewart said, "It was a frustrating night is many aspects. We had some good looks throughout the night but failed to capitalise. We need to find a way to score on the road. I thought we competed and played well. They were just slightly better than us tonight and capitalised on a couple of our mistakes."